Most recently MSMB had the opportunity to promote students through the Pekiti Tirsia Kali ranking curriculum in association with PTK Elite. It has been a pleasure to see their growth as students and to see them undertake and overcome increasing challenges both in training and in life. Through this process, it had me truly reflecting on the value of rank testing and the importance of doing it well, justly and academically. Now, truth be told, I do hold a lot of more seemingly abstruse elements to be equally as important in the progression of studentship — empathy, mindfulness, dedication, compassion, fortitude, humility, etc. But here, I’d like to talk about the importance of the skills element of the pedagogy. This year there was a decision among Elite Family instructors to really drill down and go layer by layer through the rank requirements, specific skills, language, historical knowledge, deemed essential both by our teachers and by us, collectively. In making these determinations we were looking to do a better job of making sure that , not only were we developing skilled practitioners or doing our part to protect the legacy of our predecessors but that we were giving our students access to mater ial which, perhaps, none of us have fully deciphered. Material which could then truly be theirs to explore and investigate. In the martial practice everyone brings their own personhood and thus unlocks elements only accessible to them, elements revealed through work and diligence. These are all the spaces between wherein students often teach their instructors. By utilizing a clear platform for ranking, it also calls on me to continually develop myself and work on my own weaknesses. It requires me to regularly test myself and delve deeper. In part because of my own curiosity but, as well, because It would be my greatest fault to leave a student short-changed because of my own incapacity to reconcile with challenges I face in my own study. Ranking is a funny thing. It is both objective and subjective simultaneously. The more esoteric aspects of a teacher’s pedagogy, I’ve put aside for the sake of this exploration but they are easily as essential, particularly if your institution is also concerned with developing teachers, leaders, comrades. People age, the body becomes ravaged, illness, injuries, we know them all. But, in this world of martial craft, nothing sabotages the weight of a leader’s presence in the field more then demonstrative ignorance of his/her craft, and nothing empowers a student more than to have strong foundations from which to build investigative inquiry into self and the world. How can I judge someone else’s journey? Am I clear about my expectations as an instructor and/or as a student? Do I ask discerning questions for the sake of learning or for proving? How do I evaluate the connection between my internal and external practice? Recently, I’ve been fortunate enough to conduct a variety of workshops and community programs in the area. 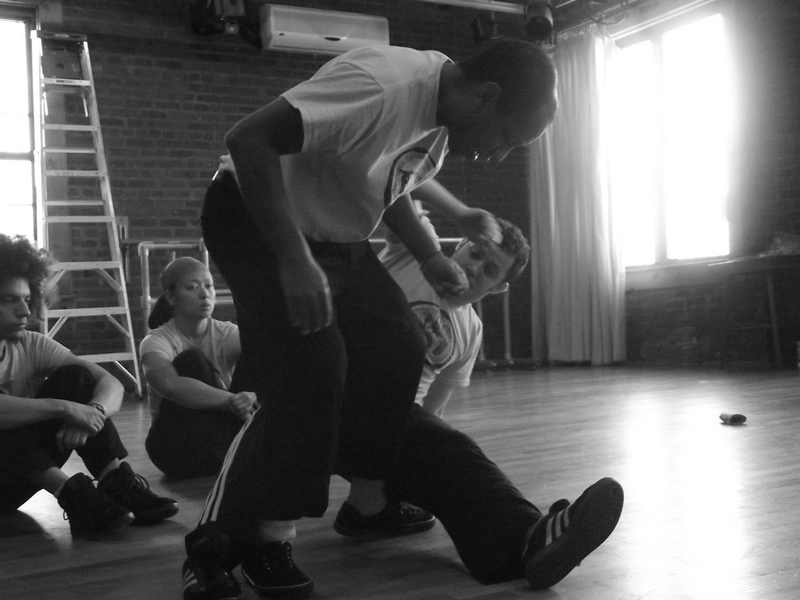 The current social climate has given people a new perspective on the importance of developing a self defense practice. This being the case, we’ve been provided a great opportunity for our academy students to step into their leadership. Over the years, with each of my teachers, I very particularly recall the time when I began to be invited to “assist” during their workshops/events. It wasn’t because I was the most advanced student but, I think, because my teachers recognized that these experiences would be lessons in accountability. Acting as a representative of my group and my teacher, I had a responsibility to model our values, to act rightly, to be smart in appearance, to be practiced and adroit. But equally important, it was an exercise in humility because these classes acted as a reminder of my own journey as a beginner and my ongoing attempts to process the concepts into a language that was discernible for myself and in transmission. “Teach to learn, learn to teach.” I’ve been hearing that a lot in recent years. What I’ve come to realize is that, this doesn’t mean that every person in the room needs to become a focal point. Not everyone has the desire, the wherewithal, or the temperament to teach, per se. But everyone does need to become a facilitator. “Ut facile,” to make easy. This does not mean that we should generate passivity in the learning environment, heat (tension) can be a catalyst for energy. But, as a student we can endeavor to grow to a point of simultaneously developing our own practices while propagating a learning environment which is conducive to the growth of others. Through this”learning to teach” becomes a state of being rather than an acquisition of status. Ask questions to learn, not for self-aggrandizement. Model focused and diligent training. Err on the side of politeness to your teachers and comrades. Treat yourself and your comrades with care. One of the stand out features of the MSMB practice is its dedication to teaching the advantages of a comprehensive training regiment. But what does that mean? There are a huge number of mixed martial arts schools popping up around the country. Perhaps there are even more academies which house various arts without determining any points of connectivity between them. But for us, there is a distinct importance in being able to put together a practice that is enriching and profound, physically, intellectually and emotionally. I think, at this point, the physical benefits of martial arts training have been fairly widely accepted. Increased muscle gain, developed reflexes and reaction time, flexibility, mobility, etc. All of these are resultant from intelligent training and continually evolving theories on how best to serve a student’s growth. The importance of a martial practice as an intellectual study is often understated. Educating practitioners on the cultures from which their arts have been born is at times considered an arbitrary aside. But in truth, the cultural and intellectual development is what helps to provide some moral foundation for how we choose to use the often dangerous practice we engage in. In the most pressured moments we don’t have time to debate with ourselves about our beliefs on violence or conflict resolution. Instead, one would hope that we’ve spent peaceable moments discussing with our comrades so that in other times we are able to act efficaciously. Culture and history provide context for these discussions so that we have the opportunity to take advantage of historical precedents. The culture of an art reminds us that it is based in humanity. Because of this it is evolving and affected by all the historical boons and faults of the people who carried its legacy along the way. With a critical mind we can learn from this and apply those lessons when using our art as a foundation for our daily living. Here we are empowering, but how do we make sure we’re not doing as much harm as help? It’s easy enough to hand out the tools but making sure that they’re utilized conscientiously… that’s another story. A lot of instructors talk about “emotional equilibrium, controlling your anger” and so on and so on. But aside from the rhetoric, how many are providing the training for that kind of capacity? As an instructor, investing in your own development as an emotional being is as important (if not more) as any attempts to integrate these ideas into your classes. Students need to see that dealing with relationships at home, at work, in the world, affect us all and our decisions on how to reconcile our emotions with the situations we encounter are as much a par t of our martial practice as the work we do in the academy. Being mindful of the fact that all of these elements play an integral part in our MSMB training philosophy allows us to create an environment where people develop their complete selves and explore new pathways to growth and wellness. I was recently having a conversation with some other martial arts instructors of various styles. One of the things that came up was the fact that, for the most part, along with the physical stimulus that training provides, one of the things that’d kept us involved for so long was feeling a sense of richness through involvement with the people and ideas of another culture. Now, I don’t want to say that this is or must be an interest for all students. But for us, in common, it’s been an integral part of our practice and, as such a priority in our instruction. So how do we convey that to our students? As importantly, how do we convey that in a way that doesn’t diminish the reasons that each individual has for investing their time and energy into an activity that often has no reward other than that which the participant gleans? Is it timely? Sometimes a moment presents itself. Perhaps a situation occurs, a movement or idea reveals itself and, in this time a historical or cultural reference is the perfect framing feature. It might give context for a way of doing things or for the evolution of a concept. It might, as well, give some insight into the mindset of those figures who had, at times, practical reasons for the design of their craft. Is it enriching? For many students, having a deeper knowledge of the practice to which they have dedicated themselves gives them a greater sense of purpose. They come to see themselves as guardians of ideas and, in the most fortunate of instances, as researchers who dispel myths and contribute to the archive of developmental resources. Is it relevant? Class isn’t the time to bloviate about all of your past accomplishments, about the awards you’ve won or the opponents you’ve beaten. Check yourself and, if it isn’t in service of the practice maybe keep it til you’re out having a drink with your buddies. Remember that your stories and the ideas they convey become part of the culture of your school as well. Integrating history and culture into the practice of your students takes a real sense of scope and a strong concept of what you hope for your community to embody. You are shaping values in subtle ways. It can be tremendously enriching or it can be the “turn-off” that pushes hard training students out the door. Done well, it turns your students into teachers and re-creates the story as a living thing. A lot of the new heads in Capoeira Angola might not know her name but a lot of the legacy of powerful black women making strides in the game is due to her. I had the good fortune to share space with her during this trip to New Orleans and it came rushing back, the memory of her as a figure who refused to give up her personhood for the sake of hierarchical structures and who represented a powerful womanhood in a game that required an often confusing mixture of boldness and humility. In many ways she embodied and continues to embody the canonical elements of struggle and perseverance that our capoeira songs espouse. I’ve recently returned from another visit to Seattle. Pastinha Weekend, an event that the International Capoeira Angola Foundation hosts annually in order to acknowledge our lineage, to reflect on the roles of revolution figures of African descent and to reconnect with our family and friends. The weekend was beautifully put together and had all the richness and love that I’ve come to expect from these gatherings. As an educator though, I wanted to reflect a bit on Mestre Silvinho’s standout capacity to create a nurturing environment within which his group seems to have truly flourished. 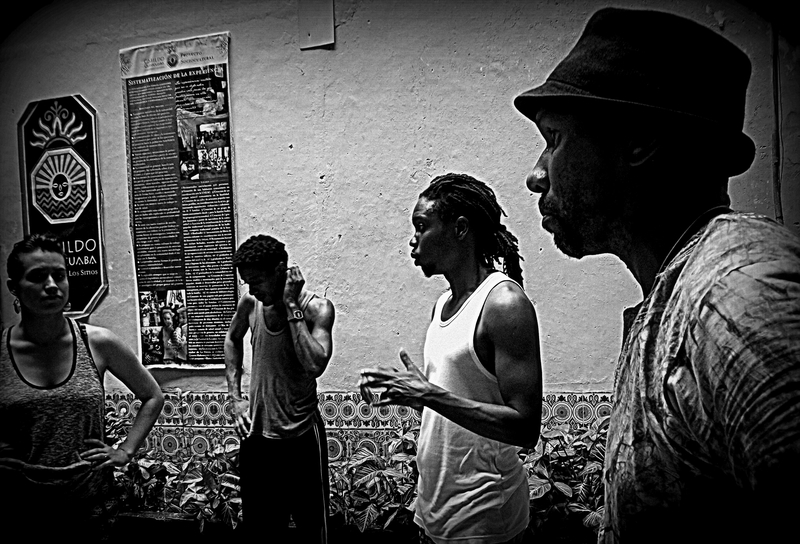 Holding space as a mestre of Capoeira Angola, as a teacher and as a mentor presents a wide array of challenges and rewards. Profoundly, this person is both, responsible for the maintenance of a centuries old tradition and, simultaneously, must assert the viability of traditional culture in contemporary society. It isn’t enough for them to deny the existence of the word in which they live but they must also have a critical and evolving vision of how to reconcile the humanity of their community with the society wherein they function. What make Silvinho’s model so particularly distinct is the feeling of mutual respect that he propagates within his collective. Not only does he humbly distinguish himself as a remarkably knowledgeable and responsible patriarch, but he so clearly and openly recognizes the strengths and hopes of the members within his group. That being said, while he provides the trajectory, his group drives its own forward motion. As a teacher the best example we can often set is in our capacity to allow leadership to disseminate throughout. True, there is no one else who has the capacity to teach capoeira at the same measure, but their functioning grant writing commission? The healthy foods project? Their regularly organized occasions for fraternization? The youth projects? All of these are student inspired and driven. Fertile soil for seeds to grow. Inspiring to see things come to fruit Northwest. So, I’ve spent the last couple of weeks trying to wrap my head around the entirety of my recent experience in Cuba. Working with other artist-educators, exchanging ideas about this endless work of empowering youths in marginalized communities, all of it was tremendously inspiring and thought provoking. I’ve been wanting to share that here but instead, in trying to encompass everything, I find myself spinning and inadequately capturing the profundity of things every time I try to put something on paper. I’ve decided I need to break this down for myself. Over the next few weeks I figure I’ll take moments, pieces of that short but impactful time and engage in some explorations. 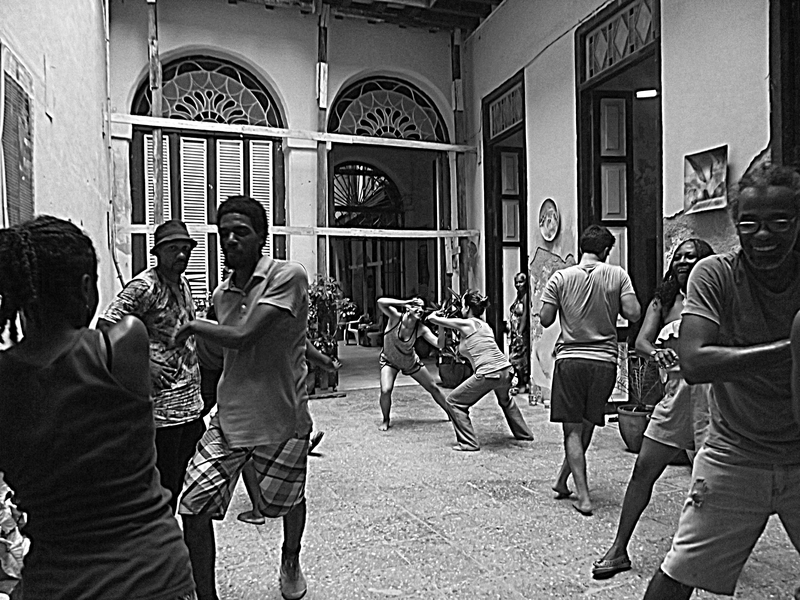 That being said I wanted to start by discussing the workshop I facilitated in Havana using capoeira as the medium. My objectives were to explore the ideas and constructs that determine our process for valuating beauty. In addition I wanted to use this exercise as a catalyst for conversations on the concept of “embodying the spirit” and using the body as an efficient language tool. We kicked it off by doing a brainstorm on popular concepts of beauty. In part this was an opportunity for us to reflect on the ways in which social constructs sometimes diverge from our unqualified humanity. When we moved into “ginga” I offered the structures as suggestions instead of rules. It was an interesting practice for me, to look at this form of engagement with laser focus on facilitating a journey of discovery instead of instructing a lesson. A humbling thing to let go of my usual objectives and to hone in, much more deeply, on the method and process of sharing ideas. We took the opportunity to explore the emotions tied to the tension and relaxation of muscles, the exploitation of the joints and the fear that is tied directly to the concept of equilibrium. Each individual then chose an emotion that they had recently engaged with, something to which they’d had a strong response and maintained vivid memories of the physical experience. After a moment of meditating on this emotion they partnered off and used ginga as a vessel through which they could embody this emotion and see how it might inform their interactions. Our next step was to recall our conceptions of central figures in our lives, matriarchs, patriarchs, elders, youths and through each of these lenses we interacted with our emotion experiment in greater depth. So, through this we were able to tap into an experience of beauty as a concept that exists in greater part due to its capacity to stimulate emotional resonance as opposed to a design which we accept as beautiful because particular language has been associated with it. As a next step we decided to use the language of the body to investigate the experiences of our compeers. In capoeira we often talk about the body conversation as a game of questions and answers. As often as not though, a player may ask questions without giving truly intentional scrutiny to the merit of his/her camarada’s responses. It’s easy at times to get caught up in your own movement, in the power of inquisition, in the sound of your own voice. But capoeira, as life entire, has the necessity of maintaining a balance between pressure and growth. We looked at our kicks and escapes as equal opportunities to observe ourselves as well as the our embodied identities of our counterparts. We then processed the effects of the experience on our ideas about interpersonal communication. How would we take this practice and apply it in our visual arts programming, our music, theater, writing? Did we gain some new connection to the somatic process underlying emotion? How could this be relevant to the work we do with youths? What will it mean to create something “beautiful” in the future?